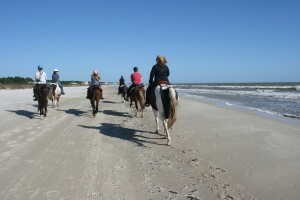 Broke-a-Toe offers 1 and 1.5 hour rides on the beaches of Cape San Blas throughout the year. In summer we limit rides to 1 hour due to heat and number of available hours for riding. Remainder of your hour is spent on horseback out on the beach, which is normally 50-55 minutes or longer. We ask families to arrive 10-15 minutes prior to their ride in order to sign in and fit helmets (required for children) before ride time. NOTE: During summer, when we are on a schedule, remember that if you are not early, the amount of time it takes you to visit restroom, change shoes, get signed in, etc. is your ride time. We try to work with you and get as close to your full ride as possible, but it is not fair to horses nor next riders for us to be running late and horses not get their break between rides because you were late. We normally ride as a group with 10-15 feet in between horses. We have found that it is more enjoyable for family members to be able to ride alongside each other rather than in a long line. This allows for conversation, picture taking and also allows the guide be in closer proximity to riders in order to answer questions and control group activity. Occasionally, the horses will string out in a long line on their own depending on their walk speed or how they feel that day. We allow the horses to walk at the pace they feel comfortable with and do not pressure them to walk faster than their “normal” pace. Gulf County requires horses to wear tail bags to catch any waste from the horses. They are only functional in catching “poo” if the horse is at a standstill. If we notice that a horse is stopping to take care of business, then all horses are asked to stop so that we can make sure no waste is left on beach. There is no way to predict how many times this will happen on a ride with six horses but a healthy system means a healthy horse so we don’t mind and ask you to be patient with them, as well. Military, Law enforcement and first responder families are given a complimentary photo package for their service. Please let us know when booking. ALL summer rides are one hour in length. ALL rides are scheduled on EASTERN time. Click here to request a ride in advance of your visit. Only use this form for reservations at least two weeks out.